Have your wedding at LaSalle! Located in the heart of Gold Coast / River North, our beautiful Sanctuary is perfect for any wedding. LaSalle Street Church is a non-denominational church that welcomes couples of all kinds– from within and outside of the church– to celebrate their sacred commitment to each other in our space. Our wedding chapel has recently been outfitted with state-of-the-art video equipment; multiple high-definition cameras allow for streaming and compilation of gorgeous wedding videos so one can relive that magical day for years to come! Cornerstone Center, our community building, is just a half block away and a great location for your reception. 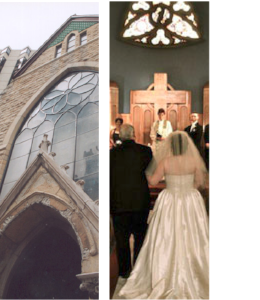 Learn more about weddings at LaSalle.